Most stars can only be seen when nighttime sweeps away the sun. They shine the brightest when man-made light is low and their beauty can be fully appreciated by the naked eye. But for the Houston Comets, the time to shine was always under the brightest of lights. Usually in front of a sellout crowd at the Compaq Center and with the highest stakes. The Comets were the team that rose in the Eastern Conference in the WNBA’s inaugural season and set the tone in the Western Conference during their final three championship runs. This was not a team that was simply satisfied with joining the Minneapolis Lakers, Boston Celtics and Chicago Bulls as the only professional basketball teams to win at least three straight basketball titles. Halley’s Comet graces us every 75 years, and in the sports universe, a new team wins four consecutive championships almost every 14. These Comets became only the fifth professional team to accomplish that feat — 1959-66 Boston Celtics, the 1980-83 New York Islanders, and the 1936-39, 1949-53 New York Yankees and the 1956-60, 1976-79 Montreal Canadiens did it twice — and Houston did so while going 98-24 and only losing two playoff games over that stretch. In 1997, the team’s average game attendance started at 9,703, rose to 12,602 in 1998, dipped to 11,906 the following year, and bounced back to 12,255 during the fourth championship run. The New York Liberty, Phoenix Mercury and Washington Mystics were the only teams with better attendance during that stretch. 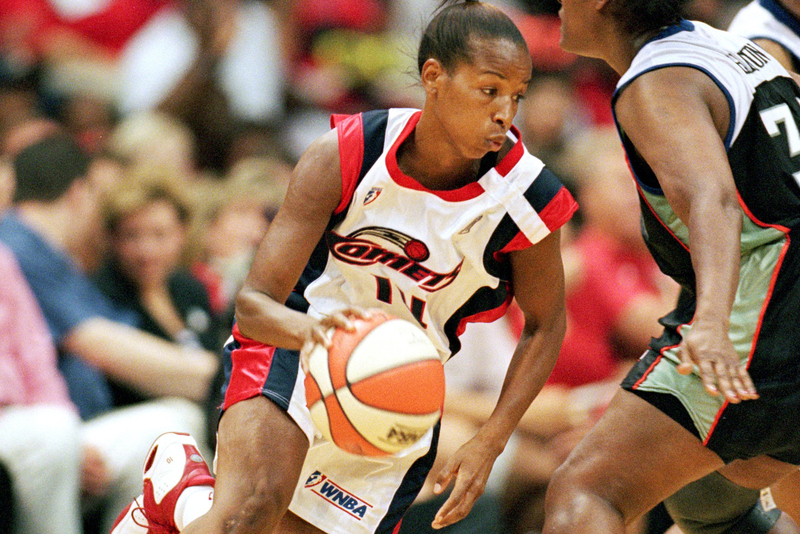 Thirty-four-year-old rookie Cynthia Cooper was a two-time MVP, Sheryl Swoopes was a three-time MVP in her own right and Thompson became a four-time All-Star. Their championship teams were the first women’s professional team to visit the White House Rose Garden. They also produced the first woman to earn a major shoe sponsorship deal. 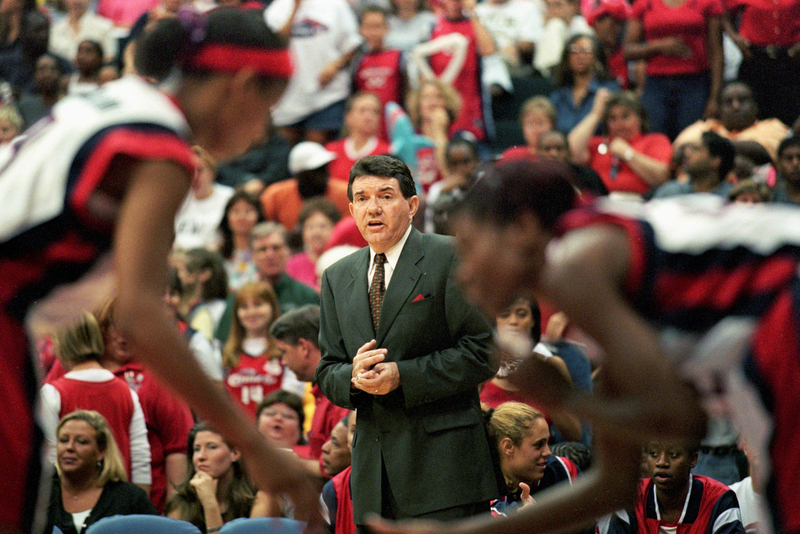 Head Coach Van Chancellor of the Houston Comets watches from the sidelines during a game against the Los Angeles Sparks at the Compaq Center in Houston, Texas. They were let loose on the basketball scene by coach Van Chancellor, who was a three-time WNBA Coach of the Year (1997, 1998, 1999), three-time Western Conference All-Star coach (1999, 2000, 2001) and was the coach of the league’s All-Decade Team in 2006. Chancellor retired from the league in 2007 as the winningest coach in WNBA history and the only coach to spend 10 years with one franchise. The former Ole Miss coach was undefeated in international play (38-0) and led Team USA to gold in the 2002 FIBA World Championships and 2004 Summer Olympics in Athens, which earned him the USA Basketball Coach of the Year award. For all that Houston gave to the sport of basketball and the WNBA, eight years after the team’s final championship, it was dissolved. The team did not survive to see the 20th anniversary of the WNBA. Even though only Cooper’s and Kim Perrot’s jerseys hang from the rafters of the Toyota Center, where the Houston Rockets play, the team’s import lives on through players who grew up watching the Comets and the milestones they set during that run. As time has shown, the Comets created records during that four-year run that, at points, even appeared unbreakable. That was all on the Comets, Chancellor and just a little bit of good fortune in the early stages. No, the WNBA actually intended the opposite of what happened. Val Ackerman, the first president of the WNBA, said they did their best to spread the wealth out among the original eight, so that every team had a chance to not only be competitive, but to win the championship. “The league, we ended up having probably an usually large role in distributing the players early on,” said Ackerman, who is now the commissioner of the Big East. “So the fact that they wound up doing what they did was a bit of a surprise, to be honest. It wasn’t anything planned. The first 16 players were assigned by the league, two per eight teams. There were range of factors that went into the assignments. Some of it had to do with the market, specifically Lisa Leslie, who was from Los Angeles, had attended USC and made perfect sense to assign to the Sparks. Rebecca Lobo, one of the early signees, was from the Northeast and had gone to UConn, and the closest organization was the New York Liberty. Swoopes was another original signee, and with her being from Texas and attending Texas Tech, she was a natural fit for Houston. 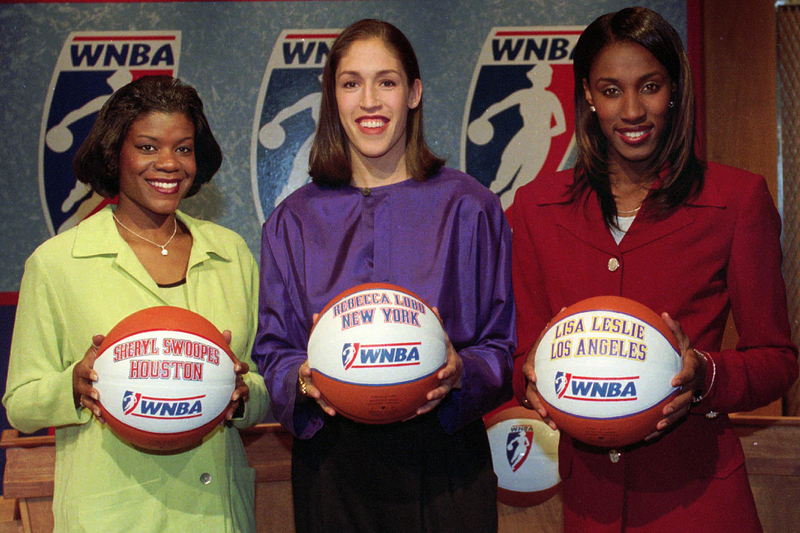 Sheryl Swoopes, left, Rebecca Lobo, and Lisa Leslie, right, 1996 Olympic Gold Medalists for the United States, hold basketballs designating the new WNBA teams to which they were assigned Wednesday, Jan. 22, 1997, in Secaucus, N.J. Swoopes was assigned to Houston, Lobo to New York, and Leslie to Los Angeles. After the early assignments were doled out, the next slate of players was placed based on competitive strength and geography. The thought was that if the WNBA could put players on teams from regions they were from or played in, it would help the league a little bit initially. They took the next 16 players and put them in the elite draft. Ackerman doesn’t recall how the league came up with the draft order, but the eight teams got to pick two players a piece, and she remembers Houston picking Brazilian star Janeth Arcain. The college draft followed, and each team received one pingpong ball for the WNBA lottery to determine draft position. The Comets came away with the top pick. Houston had almost all of the major cogs for its future dynasty, when the team made Thompson the inaugural No. 1 overall draft pick out of Southern Cal. Cooper rushed over to the scorers’ table and climbed on top of the desk for all of the media and 16,285 fans at the Compaq Center to see. She wanted all to view the No. 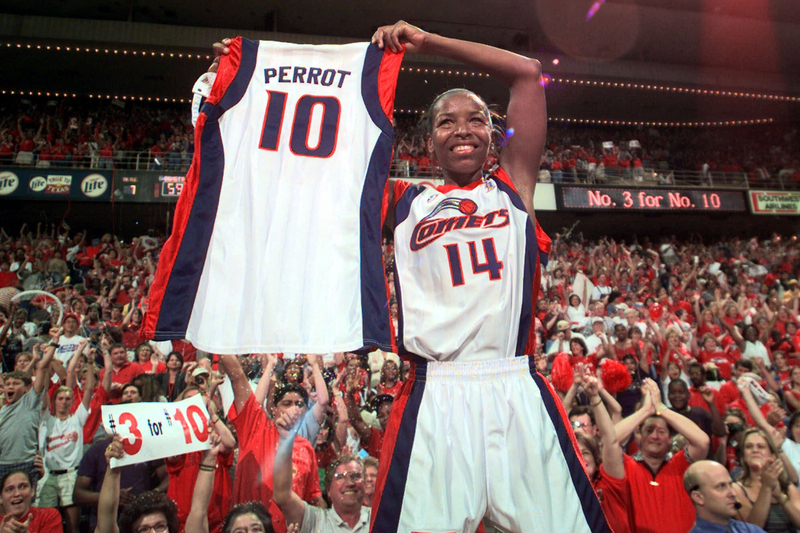 10 jersey of her teammate, Perrot, who had died on Aug. 19, 1999, after a seven-month battle with lung cancer. She wanted to remind people that this championship – this season and this particular title run – was for and about the starting point guard. Long after the final horn sounded, well past the last of the confetti falling, Cooper took one last lap around the court, jersey waving in air. Fans screamed, “three for Kim,” repeatedly or “3 for 10,” as some of the posters read. Houston Comets’ Cynthia Cooper (14) holds up the jersey of former teammate Kim Perrot as she celebrates after the Comets beat the New York Liberty 59-47 to win their third straight WNBA Championship Sunday, Sept. 5, 1999 in Houston. Perrot, who played for Comets, died of cancer. Yes, the team’s 59-47 win in the final game of the best-of-three series against New York sealed the three-peat, but make no mistake, this championship wasn’t about establishing a dynasty. It was more than that for the team and especially Cooper, whose mother had also battled cancer. “We all tried to turn that situation into something positive especially for myself,” Cooper said. “You know I was devastated. She was my best friend, and I just really wanted to pay a tribute. In February 1999, the first sign Perrot initially noticed was some weakness in her right arm. She sought out an explanation and doctors at the University of Texas M.D. Anderson Cancer Center in Houston informed her that she had a tumor on the right side of her brain. “It was a shock to me, but I’ve accepted it and I will get through it,” she told the New York Times. “I trust that the doctors are the best and will take care of me. At 5 feet 5 inches and 130 points, Perrot may have been small in stature, but she played with a larger-than-life personality. She was to the Comets at point guard what Dennis Rodman was to the Detroit Pistons at forward. She was the spark, and as Thompson recalled, she was the teammate who raised the roof. “Cynthia became kind of like famous for it — it was a part of this kind of like in-game attire, she would always raise the roof,” Thompson recalled. “People just started doing it because Cynthia was doing it all the time. Well, Cynthia actually stole that from Kim. It was something that Kim did but because Kim was our point guard, and she didn’t really score a lot, [and] Cynthia scored tons…she would kind of raise the roof after she did something really cool. Raising the roof, even then, was really lame. They just made it kind of like cool again. Perrot hustled for every last one of the 26 school records she broke at the University of Southwestern Louisiana, where she graduated as the scoring leader with 2,157 points, and her 30.1 points a game her senior season led the nation. Before being added to Houston through the team’s tryout process as a developmental player, Perrot played in France, Germany, Israel and Sweden. With the Comets, she averaged 7.2 points, 4 assists, 2.9 rebounds and 2.6 steals a game. She died at the University of Texas M. D. Anderson Cancer Center of lung cancer at age 32. Perrot was the reason the team never had to look back in the final game of the Comets’ series against the Phoenix Mercury in 1998. She hit a pair of free throws and connected from downtown to put Houston up, 50-47, in the WNBA’s inaugural best-of-three Finals series. This was after the Comets squelched the first game, 54-51, and were trailing by a dozen with 7:24 remaining in the subsequent elimination game. Houston needed overtime to revive its chances, but managed to come out victorious with a 74-69 win. Swoopes scored 11 of her 16 points in the second half and Thompson finished with 18 points. The New York Liberty and Comets were well acquainted with each other by the time they reached the one-and-done WNBA Final. Houston accounted for three of the Liberty’s wins during its 7-0 start. The Comets gained their bearings by the fourth and final regular season game between the two teams, blowing the Liberty out, 70-55, in New York. By the time Houston reached the WNBA Final, the Comets game was planned so well that they won the 65-51 victory in a wire-to-wire finish. In front of a sellout crowd of 16,285 at the Summit, the team never once trailed New York. Red, white and blue confetti was dispensed, fireworks were set off and Kellogg’s Special K boxes with the “Big Three’ on the front and a team photo on the back were handed out. Thompson scored 18 points and Tammy Jackson pulled down 11 boards during her season-high 37 minutes of play. Cooper, who spent 11 years playing basketball in Europe, finished with 25 points, four assists, four rebounds, three steals and doubled up on her MVP awards, earning the playoff MVP award in addition to her regular season crown. The moment was especially big for her, because at the time, her mother was in the midst of chemotherapy for breast cancer. “I cannot have imagined that we would have been so successful and that it would be such a special moment for me and my mom,” said a 34-year-old Cooper to the Philadelphia Inquirer. The Comets’ fourth championship run was one of their finest, because for the second time in three years, the team took home the title after an expansion year. The WNBA grew from eight to 12 from 1997 to 1998 and 12 to 16 from 1999 to 2000. Unlike the 1998 championship run, Houston did not drop a single game en route to its fourth and final trophy. The team defeated the Sacramento Monarchs, Los Angeles Sparks and Liberty in straight sets. Cynthia Cooper #14 of the Houston Comets dribbles the ball during the game two of the WNBA Finals against the New York Liberty at the Compaq Center in Houston, Texas. Houston finished the season on an 11-game winning streak – including the six playoff victories — and won 11 of 12 playoff games at Compaq Center of its four-year fun. The 68-67, last-second Liberty victory in Game 2 of 1999’s WNBA Finals was the Comets’ only blemish. Of the Comets final 36 points, 32 were scored by Swoopes and Cooper, who announced that she was retiring at the conclusion of the postseason. She forced the extra period by hitting a three with 21 seconds remaining, tying the game at 64-64. The final two points of the game were provided by Swoopes, who set a career playoff high with 31 points, and Cooper hauled in the final rebound and held on tightly as time expired. When asked about being a dynasty the year before, Swoopes talked down the idea of the Comets attaining that status. After winning their fourth title, there was no question: The Comets were indeed a dynasty. As quickly as the Comets ascended to the top of the league, their descent was slow and painful over Houston’s final eight seasons. The annual fall parades that Houstonians became accustomed to during that championship run came to a screeching halt. Following Cooper’s retirement and for the first time in the franchise’s history, the Comets didn’t make it out of the conference semifinals and were swept by the eventual champion Los Angeles Sparks. Even though Swoopes was lost for most of the next season with a torn ACL, Houston stormed back on the scene in 2002 with a 24-8 record, but was upended again in the semifinals, this time to the Utah Starzz in three games. The Sacramento Monarchs bounced the Comets, 2-1, the next year, and in 2004, Houston missed the playoffs for the first time in franchise history. There was hope in 2005, when the Comets returned to the playoffs and returned to the conference finals for the first time since 2000 by knocking off the defending champion Seattle Storm in three games. But visions of returning to the WNBA Finals were struck down quickly as the Monarchs swept Houston en route to Sacramento’s first championship. In 2006, Chancellor’s final season as coach, the Comets made the playoffs but were once again swept by the Monarchs. It was the last time Houston would make the playoffs before being dissolved. Houston Comets forward Sheryl Swoopes, center, leans her head on her hand as she sits on the bench with teammates Michelle Snow, left, and Dominique Canty in the final moments of the Comet’s 92-64 loss to the Sacramento Monarchs in a WNBA basketball playoff game in Sacramento, Calif., Saturday, Aug. 19, 2006. Comets owner Leslie Alexander announced that he was selling the team in October 2006. It was a part of a trend in the WNBA, and Houston would become the fifth team in the league to move from an NBA parent to an outside ownership. Chancellor retired before the new ownership took over, and on Jan. 31, 2007, the Comets were sold for $10 million to Houston furniture retailer Hilton Koch. After starting the 2007 season a miserable, 0-10, the Comets would go on to miss the playoffs for the second time in franchise history. Koch decided to move the team from the 18,000-seat Toyota Center to the much more intimate Reliant Arena for the 2008 season in order save money in the face of the recession and declining attendance. In 2008, the NBA laid off 80 employees as a result of the economic climate. But in that same year, the WNBA’s average attendance, television ratings and sales increased, and new major sponsors partnered with the league and inked a deal with ABC/ESPN that paid upfront rights fees for the first time. By September 2008, the stars that had aligned for Houston during its inaugural season and the three there after had almost completely moved on. The same franchise that experienced the best of being in the right place at the right time was put on sale six weeks before its final game and didn’t even get to play said game in Houston. Hurricane Ike forced the league-owned Comets to square off against the Monarchs at Texas State’s Strahan Coliseum in San Marcos. But Thompson, the sole member of the original team, made sure the Comets ended on a high note, scoring 31 points in a 90-81 victory. Although there was hope that Houston, the nation’s 10th-largest market at the time, would find a way out of the situation, on Dec. 1, 2008, the league suspended the team’s operations. “It was a very big misjudgment on the league’s behalf, in the sense that I just don’t think that they really do business properly and didn’t value what that franchise brings,” Thompson said. “It’s pretty sad that Sheryl Swoopes is now in the Naismith Basketball Hall of Fame, and she doesn’t have a place to hold her professional history. There is an arena, like of course the banners are up there, but her jersey isn’t even retired. (L-R) Hamchetou Maiga-Ba #99, Mwadi Mabika #4, Michelle Snow #2, and Tina Thompson #7 of the Houston Comets huddle on the court during the WNBA game against the Atlanta Dream on June 16, 2008 at Reliant Arena in Houston, Texas. “One wonders what is in store for the rest of the league if a franchise with the Comets’ history — in a huge market that has displayed as much interest in women’s basketball as Houston did that long ago — can’t survive,” said Houston Chronicle columnist Jerome Solomon. Tangible impacts of the Comets were the girls who grew up in Houston during that era and played in the league such as Brittney Griner, Lindsey Harding, Chiney and Nneka Ogwumike. Or the coaches the team produced such as Cooper, head coach at USC, Dawn Staley, head coach at South Carolina, Swoopes, a former coach at Loyola (Chicago), Thompson, an assistant coach at Texas and Coquese Washington, head coach at Penn State. Then there are former players like Kara Lawson, and current ESPN commentator, who had a poster of Cooper pinned right next to her Michael Jordan fit on her bed room wall. During her rookie season, Lawson was a member of the Monarchs team that helped close the book on the Summit Arena/Compaq Center, beating the Comets in their final WNBA home game there during Game 3 of the 2003 semifinals. Years later, Lawson would actually get to play with Thompson on the All-Star team, which she described as a full-circle moment because she had watched the forward’s game since she was 16. “I assume most most kids have posters on their wall and for me growing up, I had mostly men, because there weren’t posters of women, at least playing basketball,” Lawson said. “I had Jordan and different people, and then the WNBA towards the end of high school. I was fortunate enough to make All-American team and Cynthia Cooper was there, and she signed posters for all the high school players, so yes, Cynthia Cooper was the first women’s pro player that I had on my wall. In the eight years since the Comets were shuttered, the league has downsized from 14 teams to 12. It has not seen a team repeat as champions since the 2001-2002 Sparks and there remains no talk of a team returning to Houston. But out of the ashes there looms a team hoping to tie the almighty Comets’ championship record. Led by forward Maya Moore, the Minnesota Lynx are one game away from matching Houston’s championship record. Facing elimination Sunday night at the Staples Center in Game 4 of the WNBA Finals, Moore scored a playoff career-high 31 points and added nine rebounds, five assists and three steals in the 85-79 win over the Sparks. With a win, the Lynx become only the third WNBA team to repeat as champions and cement their status as a dynasty. With a loss, the Sparks become the third franchise with three titles and set up a near future with the kind of rivalry the league hasn’t seen since the Comets and Liberty back in the day. After losing five of the original eight teams, shifting the ownership model and enduring an economic crisis, as the 20th anniversary of the league comes to a close, the WNBA finds itself in a win-win situation, even after losing its most successful franchise in the process. Correction: Van Chancellor coached at Ole Miss. The original story stated he was coach at Mississippi State.